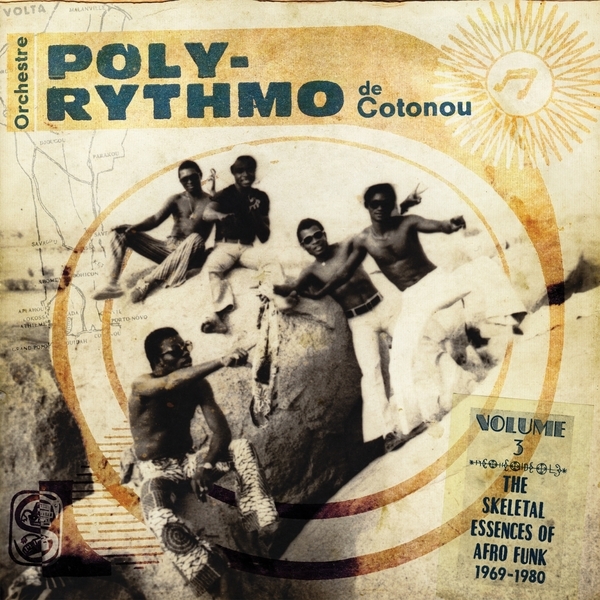 Analog Africa roll us back to Benin between 1969-1980 for a killer third volume of Orchestra Poly-Rythmo de Cotonou heat. 'The Skeletal Essence Of Afro-Funk' once again exposes the genetic roots of Vodou groove, a well trodden mash of rhythms - Jerk Fon, Afrobeat, Pop Fon, Jerk Sakpata, Cavacha Fon, Pachanga and Afrobeat - anchored by the deadly combo of drummer Leopold Yehouessi and bassist Gustave Bentho and funked up with dual vocals and the slinkiest electric guitar accents. If we're picking highlights, then the dubbed-out, double-timed Pop Fon of 'A O O Ida' is right up there, as is the tumbling polyrhythmic psych swagger of Vincent Ahehehinnou's Jerk Sakpata groove 'Pourquoi Pas' and the fiercely fuzzed-out Afro Beat percolator 'Al Gabani' or Bernard "Papillon" Zoudegnon's 'Sato' fanciful fusion of proggy organ twirl, bossa shuffle and whoops on 'Karateka', but the whole thing's a blast from start to finish.